Our wheat flour tortillas are fluffy and pliant. They are all purpose (AP) wheat flour delicacies, and we switch back and forth between these and corn tortillas, depending on the dish we’re enjoying. We always use a dash of baking powder, which makes ours different from wheat flour tortillas in other regions of Mexican cuisine. After listening for many years to heated debates about whether or not to put baking powder in wheat flour tortillas, I have come to believe that the debate is fundamentally about whether one understands that Texas Mexican exists as its own cuisine and it is not an attempt to emulate other regions where Mexican cuisine also thrives. You can decide for yourself, given the long history of food in our Texas Mexican region. These tortillas are what I grew up eating. That’s the way they are done in San Antonio, Uvalde, Raymondvile, Corpus Christ, and all the way down to McAllen, Harlingen, Del Rio, Brownsville and a bit south of the Rio Grande. If you travel farther south of the Rio Grande, you will see the tortillas thinner, not fluffy, and with more fat. I use a food processor because it is so much faster. I give precise timing in this recipe because I’ve tested the procedure and it works well. However, there are so many variables to working with wheat flour that you will have to be attentive and find your way through the process. There are three things to keep in mind. First knead the dough thoroughly– put your back into it! Vigorous kneading changes the structure of the wheat proteins to create strands of gluten that will eventually provide the structure and elasticity in the tortilla. Second, let the dough rest after kneading it. 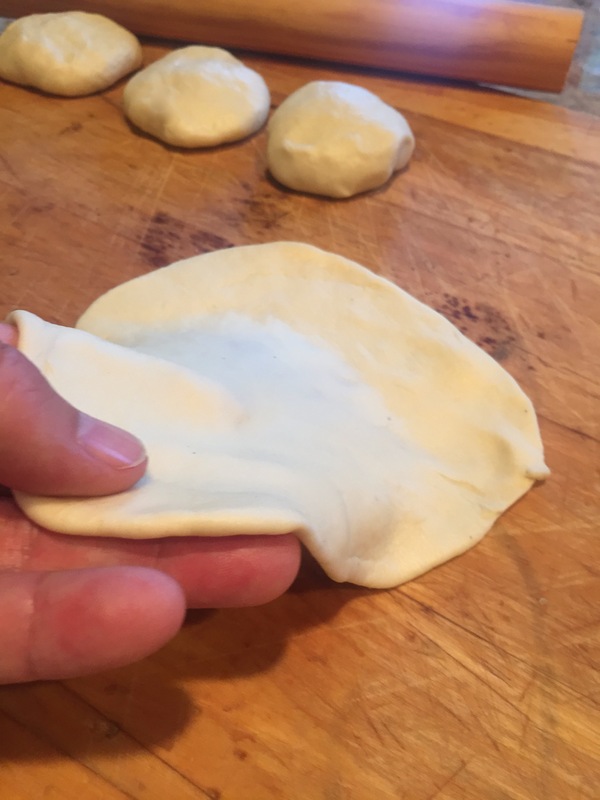 And third, make a “testal,” by rotating a ball of dough with your hands while pinching the edges and folding them under to fashion a little round pillow that has an indentation on the underside. The word “testal” is from the Nahuatl word, “Téxtatl” and refers originally to the ball of corn masa that is used to make corn tortillas. I think you will find the learning process worthwhile because these tortillas are really wonderfully soft and delicious. 1. In a food processor, with the blade attachment, place the dry ingredients and pulse a couple of times. 2. Add the shortening and process until the shortening is completely blended, or about 10 seconds. There will be no granules, but if you squeeze the flour between your fingers, it will stick together. 3. Process again and as you do so, add the water slowly until the flour forms a ball of dough. This will take about 20 seconds. 4. Place the dough in a bowl or cutting board and knead it with gusto for 6 minutes until it is shiny and definitely elastic. Set it aside to rest, covered, for 20 minutes. 5. Divide the dough into 18 balls. Form each ball into a “testal,” a little round pillow with an indentation in the middle as described above. The indentation in the middle and the fat edges will make rolling a snap. 6. Use a “palote”, rolling pin, to roll each round tortilla to a thickness of 1/8 inch. 7. Heat a comal (griddle), ungreased, on high heat, 400°F–450°F. Place a tortilla on the comal and cook for 30 seconds. Turn it over and cook another 30 seconds. Turn yet again and cook each side another 20–30 seconds. Make sure that the tortilla is completely cooked. We do not eat raw or undercooked dough. I eat these straight off the comal, sometimes with just a small dab of butter. My childhood and teenage years rise up as anchoring memories in my palate. But, of course, the universe intended that we make tacos!